Grande Harbour, where the Road Ends, Luxury Begins; Grande Harbour is one of the most unique international hot spots for fishing, diving, or snorkeling. After the adventure, get ready to relax and be pampered with a long list of luxury amenities. West End Grand Bahama, Bahamas, The, September 11, 2018 --(PR.com)-- After months of negotiations and due diligence, an agreement was reached between West End Resorts Limited (WERL) and a Bahamian Company controlled by Old Bahama Bay Resort & Yacht Harbour operator President John MacDonald to expand upon what is already one of the most beautiful resorts in all the Bahamas. “It has been a pleasure working with WERL which initiated and has been involved in the project since 1997,” stated John MacDonald. This transaction will, in effect, continue WERL’s vision to develop a beautiful self contained community on the 225 acre parcel of land that includes the Resort, Marina, Pine Island, the Isles, and immediately surrounding property. The new project will be named Grande Harbour at Old Bahama Bay Resort and will be situated on what is currently referred to as the Harbour Villa Land and Dockside Villa Property. Current plans for Grande Harbour are 460 resort style ultra luxury condos consisting of 1, 2, and 3 bedroom units. The expanded resort project will also boast a 78 slip Dockaminium with a combination of fixed and floating docks to accommodate vessels up to 75ft. The fixed docks will be made available with optional boat lifts specifically for center console style boats 40ft and under. Further, an additional 2500 lineal feet of dockage will offer ample space, power, and water for Mega Yachts. Plans also include: 2 infinity pools, hot tubs, a lavish spa, 2 restaurants, tennis courts, basketball courts, volleyball courts, largest fish cleaning station in all of the Bahamas, a convention hall with venue space, state of the art gym facilities, and a private members only club. In keeping with current resort operator IVRC’s history of community outreach, Grande Harbour will also include a community hurricane shelter for resort employees, their families and West End residents. Grande Harbour is ideally situated where the western most road ends on Grand Bahama Island, Grande Harbour at Old Bahama Bay Resort is located on one of the most secluded and sought after gems in all the Caribbean, only 56 miles from the Florida shores. Grand Harbour at Old Bahama Bay, redefining Bahamian Adventure and First Class Luxury. With a rich history going back hundreds of years, West End exudes allure and intrigue. Going as far back as the Spanish Galleon days to the William "Real" McCoy rum running days, the home of Grande Harbour is one of the most unique international hot spots for fishing, diving, or snorkeling. After the adventure get ready to relax and be pampered with a long list of luxury amenities. Your new Caribbean vacation home is easier than ever to get to with the convenience of an on-site private airport featuring a 6500 ft airstrip and an international airport in Freeport - just 26 miles away. 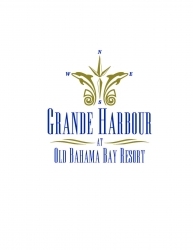 For more information about Grande Harbour at Old Bahama Bay Resort, visit us at www.grandeharbour.com.